Headlined by rookie cards for several of the greatest baseball players of all-time, 1954 Topps Baseball is further enhanced by a strong veteran roster. The appealing design and impressive checklist has resulted in one of the more timeless vintage baseball sets. 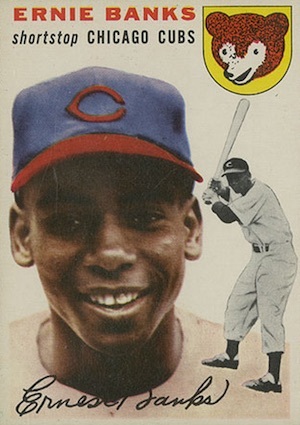 1954 Topps Baseball was distributed in three different series, including Series 1 (#1-50), Series 2 (#51-75), and Series 3 (#76-250). Although there are not any known short prints, gray backs were issued in Canada for the first series, in addition to the standard white background cards that were available in the United States. Loaded with Hall of Fame talent, Hank Aaron, Al Kaline, and Ernie Banks are the key rookie cards in 1954 Topps Baseball. Ted Williams, Willie Mays, Duke Snider, Yogi Berra, Whitey Ford, and Jackie Robinson are other top Hall of Fame options. Although not nearly on the same level as the rookie cards referenced above, collectors can also find the rookie card for Tommy Lasorda in 1954 Topps. 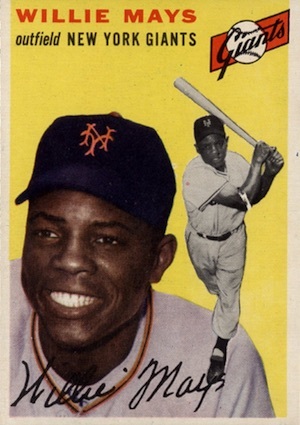 From a design standpoint, the 1954 Topps Baseball cards are slightly over-sized, measuring 2-5/8" by 3-3/4". For the first time ever on a Topps set, the cards include multiple photographs. The design features a colorized player portrait, as well as a black-and-white action shot. Card fronts come with a variety of colorful backgrounds, including white, yellow, light blue, green, red, orange and dark orange. 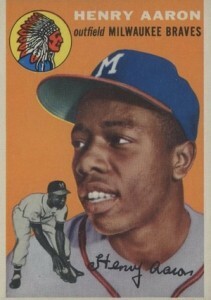 The cards also display the player's name, position, team logo and facsimile signature. 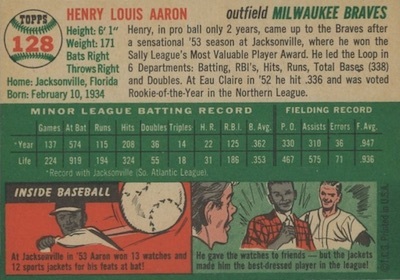 The back of the 1954 Topps Baseball cards provide both statistical and biographical information about the player. This includes the card number, a write-up about the player's career, and a cartoon frame featuring animated photos. 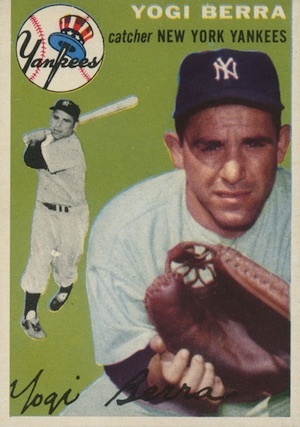 '54 Topps card backs can be found with either white, black, red, green, or flesh-tone color schemes. One of the most unique and frustrating quirks for collectors regarding the set is the orientation of the card backs. 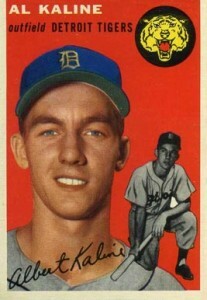 The 1954 Topps Baseball cards purposely do not have a white border on the top of the card. This was because the tops of the cards were lined-up against those of the next row on the printing sheet. What resulted is that half of the cards were printed upside down. Unfortunately, it appears that the press operator forgot to orient the card backs accordingly. 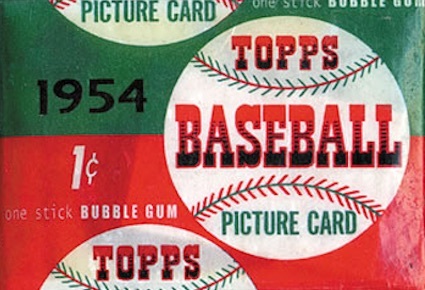 So if you go to a card show today and thumb through a box of 1954 Topps, you'll likely find that one-half of the cards have the card number at the top, and the remainder have it at the bottom. Thankfully for collectors, this is the only occurrence of such a blatant printing error. 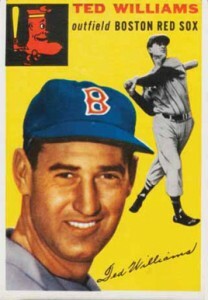 Amidst all the rivalry between Bowman and Topps to sign players to exclusive contracts, Topps landed its biggest coup when they secured the rights to produce cards of returning veteran Ted Williams. One of the game's greatest players and fan favorites, Williams' inclusion in the set proved to be a key turning point for the company in regards to market share. 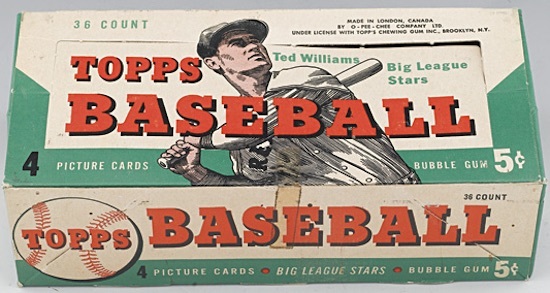 With a willingness to outspend its competitor, Topps laid the foundation for what would become an almost thirty-year monopoly in the baseball card market. 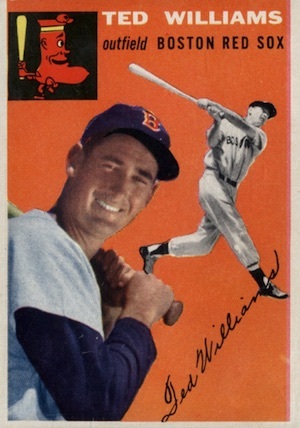 To capitalize on their investment, Topps produced two cards of Ted Williams. Book-ending the product with card #1 and #250, these cards are often found with the same defects that plague most vintage cards to fall first or last in the set. Another interesting card option showcases twin baseball players. 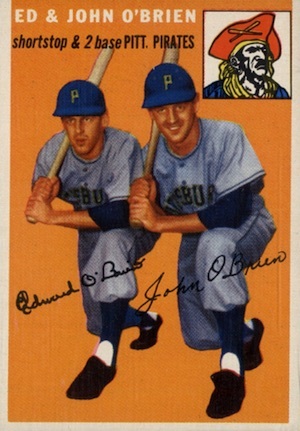 Eddie and Johnny O'Brien both played for the Pittsburgh Pirates in the 1950s and were the first twins in MLB history to play for the same team in the same game. The brothers share space on card #139. While neither had very notable careers, the card maintains solid value. Despite the strong 1954 Topps Baseball checklist, there are several glaring omissions. The battle of player-exclusive contracts isn't new to the hobby, and in 1954, Bowman was able to secure the baseball card rights to Mickey Mantle, Pee Wee Reese and Roy Campanella, thereby preventing their inclusion in '54 Topps. 1954 Topps # 20 Warren Spahn - SGC 3 VG = PSA 3 - HOF - Milwaukee Braves - Nice! 250 cards. Shop for base cards on eBay. 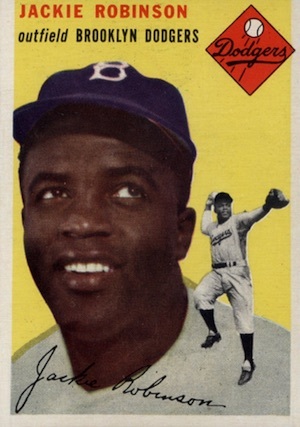 The 1954 Topps set is one of the easier sets of the 1950’s to complete, with no high number series (like in the other Topps sets from the 1950’s and 1960’s) to go after. It was not a particularly difficult set to complete. The 4 most expensive cards from this set were Mays and the rookie cards of Aaron, Banks, and Kaline. Fortunately, I completed the 1954 Topps set in the mid-1980’s, at a time when old baseball cards were a lot cheaper back then. It is a very nice set. 1954 Topps Scoop World War II Begins – #32 PSA 7!